Please read this section carefully. It contains important background material for the next two sections. In this category, it is important to distinguish between three descriptive terms. 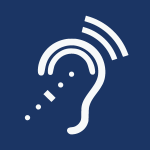 Hard of hearing – persons who have a hearing loss, but can still hear with a hearing aid or Assistive Listening Device. Some may also use sign language. deaf (with a small “d”) — persons who have very little or no hearing and rely on the English language, an alternate sign language, speech reading (sometimes called “lip reading”), print, and/or other visual materials as their primary means of communication. 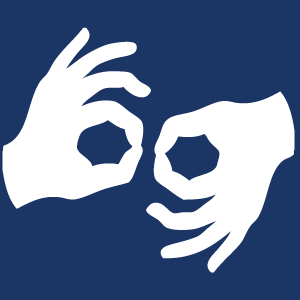 Deaf (with a capital “D”) – persons who use a distinct language, American Sign Language (ASL), and identify themselves with a cultural group (North American Deaf Culture). These individuals may have some hearing. Two separate emblems are possible in this category. interpretation can help remove barriers in communication and participation between hearing persons and those who are deaf or hard of hearing. Qualified interpretation into the particular sign system that the person uses should be provided. Interpretation into American Sign Language should be provided to enable communication between Deaf and hearing persons. In addition, under the Vision section is an important recommendation on “Lighting for speakers” Persons who rely on speech reading (sometimes called “lip reading”) also require proper lighting of the face of speakers.